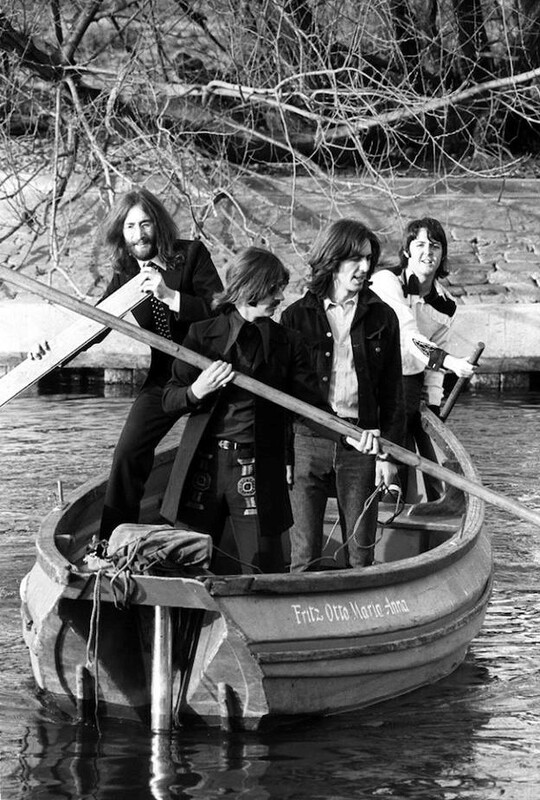 Picture yourself in a boat: The Beatles aboard the Fritz Otto Maria Anna, in the River Thames, on April 9, 1969. It’s a simplistically obvious metaphor, and a literal description of what the group was seriously considering in the waning moments of their January, 8, 1969, session at Twickenham. If the TV show in production was to be episodic, this sequence would have provided a true cliffhanger. Ringo Starr, codename “Russia,” wasn’t unwilling to drop his automatic veto, and it was John Lennon spearheading the effort withing the group, resurfacing as the group’s leader after so many years, who worked the sell on the drummer, along with Paul McCartney. “Just give me one reason to stay here,” John asked. “For the people,” Ringo answered with complete sincerity. “All right, we’ll take ‘em with us,” John replied. Paul McCartney clarified the pitch for a Winter 1969 rock cruise. Look, we were going to give tickets away at this door here and say the first thousand people who come from Britian — British, white people (said to laughter as Paul was clearly joking; don’t write his reps). No, it’s going to be the first thousand that got here. We give them out, those tickets, but they include a boat ride, as well. “We take them with us, and that’s the show,” Michael Lindsay-Hogg said. It was all coming together for Michael. 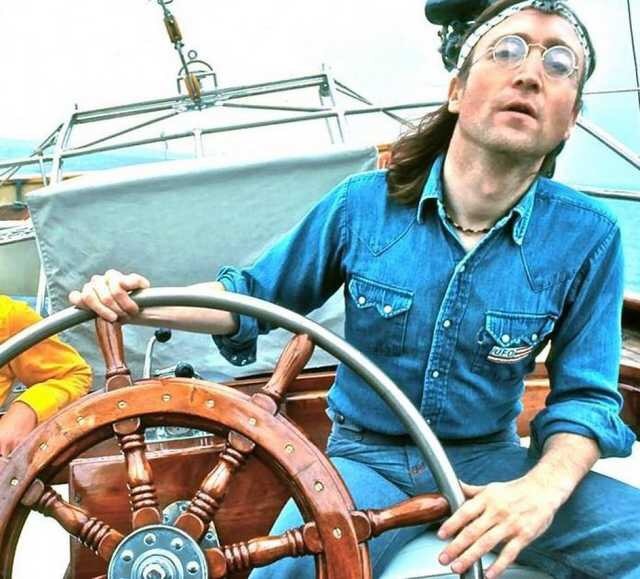 The boat trip compromise to include a British audience was a bonus for him, an easy way to compile captivating footage for his documentary, another unusual setting — the Beatles not just mingling with fans, but doing it as they sail along the coasts of Western Europe and Northern Africa. It all would culminate with his deep wish to bring the group to the Sabratha amphitheater: the world’s greatest band making its stage comeback at a spectacular, unique venue. “See, it’s like having the most fantastic set on earth, but we haven’t made a set, you know? It’s still simplicity itself,” John said. Ringo: But how many’s going to be looking at the set besides us and [Michael]? … [Viewers] want to see what’s on, not what’s around. John: We’re bound to get something from it. Ringo: A nice time, get a bit of sun. Michael: After you’ve had your nine or ten closeups each, we’ve got to have something else to shoot about. John: It’ll be like being on the roof in India, only we’ll be fully equipped. The roofs in India were where, not coincidentally, John was at his most prolific in this latter phase of Beatles history. As they wrapped up, a final, spirited discussion — as animated as the room has been with no fewer than six people all talking at once (the four Beatles, plus Michael and Apple Films head Denis O’Dell) — emerged over the cost of the boat trip, Ringo and George most concerned. Really, it was all falling into place. January 8, 1969, was the band’s sixth day back to work at Twickenham, and while most of their new songs were still a work-in-progress, the was actual progress. One day earlier, George was on the brink of leaving the group. Now, while he was bothered to do so, he was still seemingly willing to get on a boat with the group — and 1,000 fans he wanted little to do with — to go to Africa for a concert he didn’t really want to play. Ringo was dead-set against going, and now he was willing to bend. Paul was always ready “for an adventure” and as the group’s de facto musical director, he was shaping the material to have ready for the production. As for John, he wasn’t just finally involved — during the final conversation, you heard him speak on the tapes, not Yoko Ono — but he was the group’s leader again. Days of discussion of where and how to stage the concert had been a distraction from the music-making process, which needed to continue. They were almost ready for a decision. One question remained as the working day ended: Would the great democracy that was the Beatles agree to this plan for a live show and have a goal they could rehearse toward, or would January 9, 1969, be just another day? Great narrative. Would be nice if we could hear the audio. Appreciate the nice words, Pablo. Unfortunately, so long as Apple has lawyers, I’m going to stay out of the audio-posting business, but I’m always keeping my out for others who do post and I”ll make sure to add whenever I can. Also, it’s “out there” if you want to dig into downloading bittorrents and the like, but I do recognize that’s not everyone’s thing.